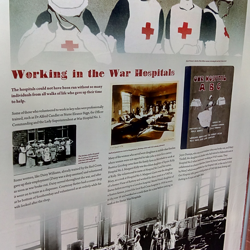 We have been very fortunate to secure an exhibition of Exeter War Hospitals from 1914-1918. 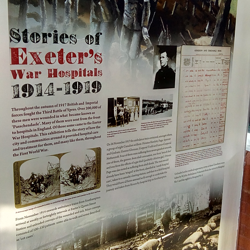 We have eight beautiful panels with information on Exeter’s role during the Great War in nursing the wounded. The panels are illustrated by a local artist, Joyce Dennys, who served as a nurse in Exeter during the war. The exhibition is free and is in our Learning Support Department from Monday 1st October until Friday 5th October. Members of the public are most welcome to view the exhibition during library opening hours. 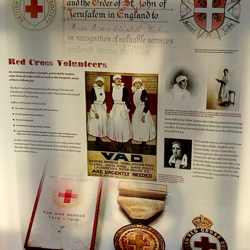 The display was in Exeter Guildhall last week and was visited by 1,500 people. After leaving us the exhibition will be in Exeter Cathedral in early November.